Cokanasiga was named man of the match after Italy were swept aside in the penultimate round of the Championship and was compared to Jonah Lomu by Sir Clive Woodward, but the Fijian-born wing is not even on the bench for the Calcutta Cup showdown. Taking his place in the number 14 jersey is Jack Nowell, who has recovered from a shoulder stinger injury, with Ben Te’o picked as replacement threequarter cover. Eddie Jones has reverted to his first choice midfield for the 2019 Six Nations with Manu Tuilagi and Henry Slade paired in the centres outside Owen Farrell. Ben Youngs will be making his 85th England appearance to surpass the national record for a scrum-half held by Danny Care. “It is a fantastic achievement for Ben, it takes a lot of dedication and hard work and something he and his family will be really proud of,” Jones said. England will win the Six Nations title if they regain the Calcutta Cup and Wales fail in their Grand Slam bid against Ireland in Cardiff. “It’s the last week of the tournament so it’s exciting. It will be a fascinating finish with three teams that can win it and we are playing against one of our most traditional foes in Scotland,” Jones said. 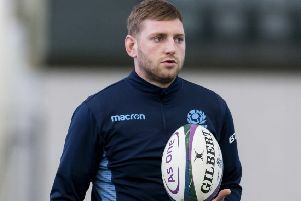 “Scotland are a difficult side - they are always at you, they play with a lot of enthusiasm and effort and have got a lot of attacking strings to their bow. 15. Elliot Daly 14. Jack Nowell 13. Henry Slade 12. Manu Tuilagi 11. Jonny May 10. Owen Farrell 9. Ben Youngs 1. Ben Moon 2. Jamie George 3. Kyle Sinckler 4. Joe Launchbury 5. George Kruis 6. Mark Wilson 7. Tom Curry 8. Billy Vunipola. 16. Luke Cowan-Dickie 17. Ellis Genge 18. Dan Cole 19. Brad Shields 20. Nathan Hughes 21. Ben Spencer 22. George Ford 23. Ben Te’o.